NEW YORK (NYTIMES) - Nasa's attempt to place its InSight lander on Mars on Monday afternoon (Nov 26) will mark the culmination of a busy year for news about the red planet. In 2018, there has been plenty to attract our earthbound attention to the fourth rock from the sun: uncommon astronomical and weather events, developments in the search for signs of life, and updated plans for the future study of Mars. 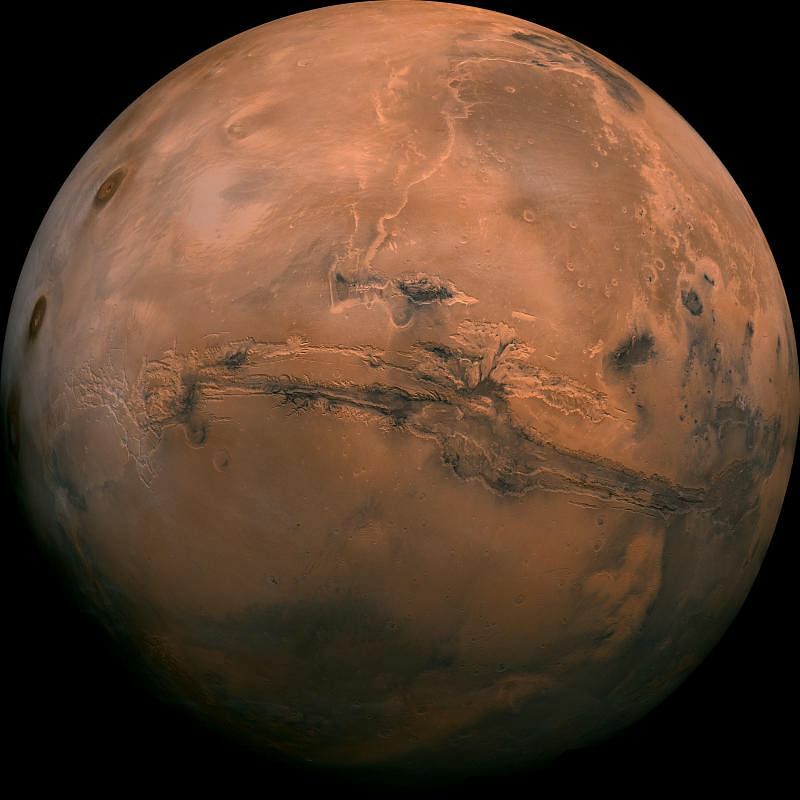 Below you'll find a recap of some of this year's notable Martian developments. No one has found definitive signs that living things once existed on Mars. But new scientific developments this year helped make the case that the cold and dusty world may have been more hospitable long ago. In June, scientists, using data from Nasa's Curiosity rover, for the first time confidently identified organic molecules used and produced by living organisms (although it is possible for such substances to be produced in chemical reactions that are not biological). Then in July, Italian scientists working on the European Space Agency's Mars Express mission reported the discovery of a large, watery lake beneath the planet's southern polar ice, suggesting an exciting new place to search for life-forms. Starting in May, Mars was enveloped by one of the most massive dust storms ever observed on the planet. As the storm blotted out the sun, it also silenced Opportunity, one of the two Nasa rovers studying the planet's surface features. Drained of power, Opportunity has not called home to Earth since, although Nasa hopes winds on the planet will remove dust from its solar panels and allow its batteries to charge again. Other weather on Mars yielded its own intriguing imagery. In a picture released by the European Space Agency, a large cloud formation trailed one of the planet's large extinct volcanoes. It wasn't a volcanic eruption, although it could have been mistaken for one. A number of space agencies around the world intend to send robotic explorers to Mars in the next decade. Plans for Nasa's Mars 2020 rover came into clearer focus this year. Earlier this month, NASA announced the destination for the rover, which will be similar to the active Curiosity rover, but with improved instruments for scientific study. The Mars 2020 rover will attempt to land at the Jezero Crater, which used to be the site of a large lake and rivers. Scientists say that spot offers a good target for collecting samples that could point toward signs of extinct life: That rover will also carry something never before sent by humans to another planet - a small helicopter. The four-pound rotorcraft will take photographs and demonstrate the possibilities of flight in the thin Martian atmosphere during five short takeoffs and landings. If you were fortunate this summer, you looked up at your night sky and spotted a large red dot. It was Mars. During a brief window every two years, Mars and the sun are on opposite sides of Earth, a formation also known as opposition. But once every 15 years or so, that state of opposition lines up with the moments in Mars' orbit when it comes closest to the sun, or perihelion. That rouge orb, brighter than usual in our summer skies, was a vivid reminder of the rusty red world sharing our star. From that vantage it fired our imaginations, and it may again on Monday, when the InSight lander tries to find a safe spot on one of Mars' dusty plains.